"Under-bed bins are a really nice way to get clothes out of the way." 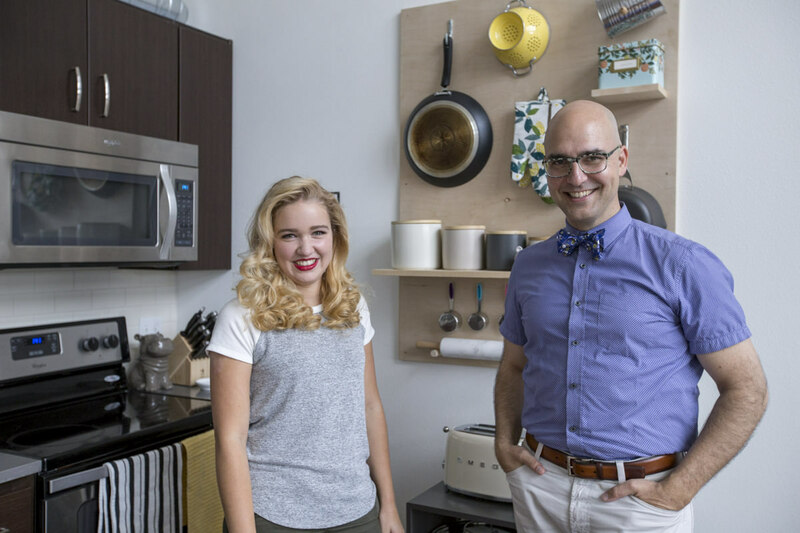 Today, I’m chatting with Kirsten about what’s working well in her small space, and offering ideas on how she can maximize these areas even further. In part one of this series, we looked at the entryway, living room, and kitchen. In part two, we explored the multi-purpose room—which features her office and laundry room (and unfortunately zero overhead lighting)—and the bathroom. 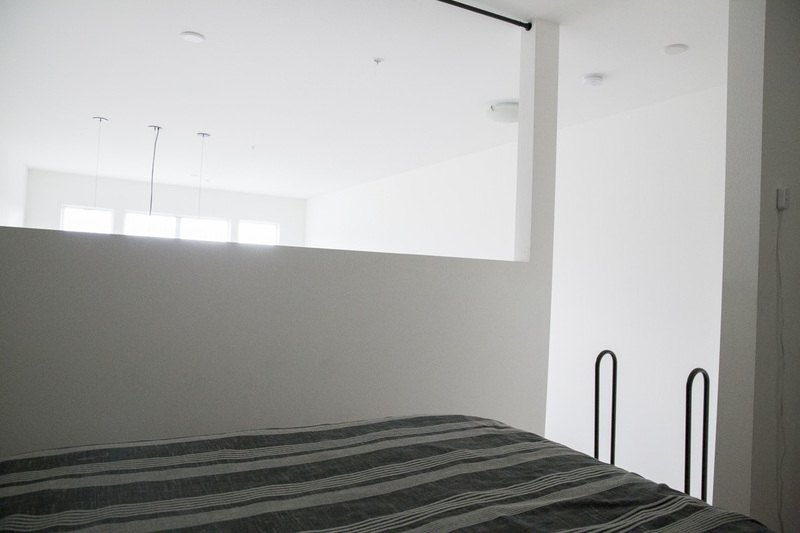 Today, we're wrapping up the series with Kirsten and her husband Nick's lofted bedroom. Kirsten and Nick decided to loft their bedroom, which Kirsten has described as both a ton of fun, and an interesting challenge. Props to them for somehow managing to hoist a bed up a ladder! 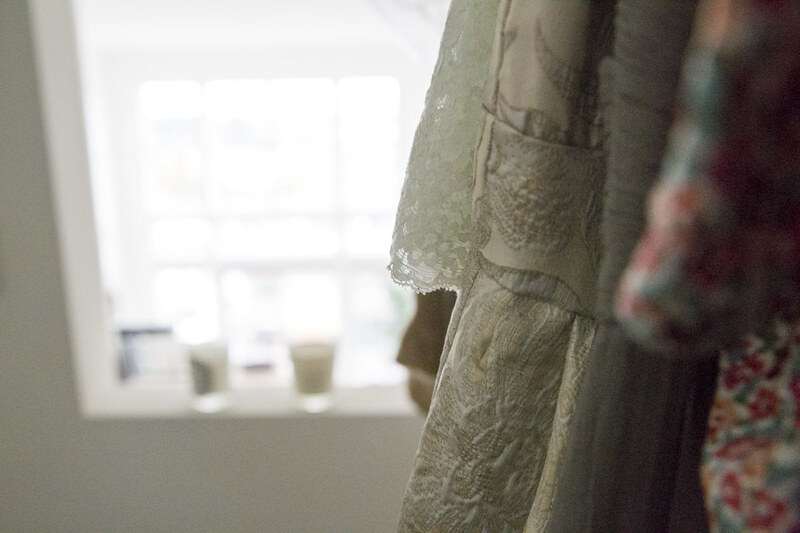 With no closet in the loft, Kirsten keeps her hangable wardrobe on a simple open rack. The loft has a cutout in the drywall right by the niche Kirsten cleverly purposed for clothing storage. The opening lets in additional natural light, which is great, but it also means her clothes are visible from the entry and great room below (and looks a bit unsightly). Apply a translucent panel over the opening for a solution that keeps the light pouring in but hides the niche’s contents. It can be artful, even backlit to make it visually interesting from below. And rather than stare at clothes as you rise from and fall into sleep, a curtain can stow it all nicely out of view. A suspended rod and drapery or even a sliding door system will transform the niche into a more defined closet-like area. Kirsten and Nick make the most of their under-bed storage, too, which is a great way to get lesser-used clothing and shoes out of the way. Using every possible concealable space for storage is key for small spaces. Additionally, if your space is deep enough (this one isn’t), you could pull the bed and nightstands forward and create closet storage behind the headboard. A lot of Seattle’s newer loft spaces feature exposed pipes in an effort to evoke a cool, industrial effect. Sadly, the appearance is often lacking. 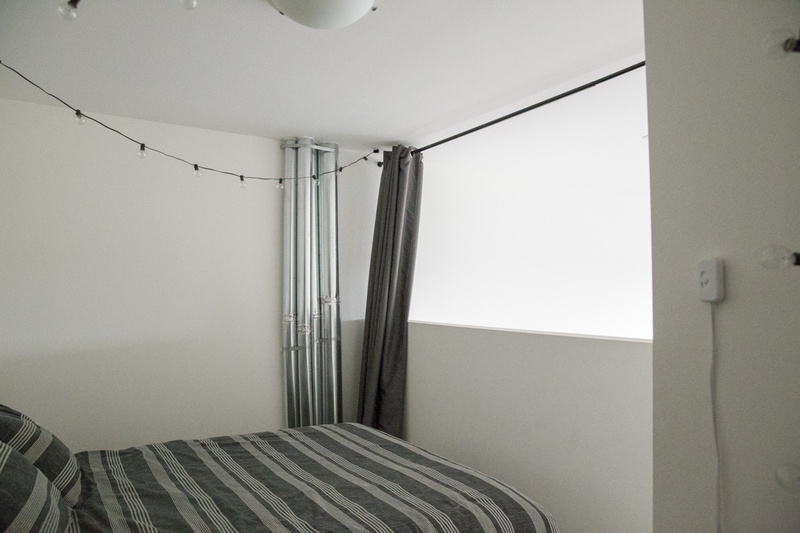 If you’re in an apartment where it looks like they forgot to hide the pipes in the wall, here are a few options: First, continue the curtain. Kirsten and Nick already have a nice curtain that pulls across the loft’s opening to block light and offer additional privacy. Drapery has a powerful effect in housing. The rippling texture in the curtain's folds is like tucking under a blanket. Kirsten and Nick could wrap the drapery around the entire backend of the loft—including the opening—to conceal the not-quite-cool pipes, heighten the cozy comfort of the space, and still conceal and reveal light on the adjacent wall as needed. Second, they could find a creative way to make those pipes an artistic component in the space, by covering them entirely in paper-cut texture, sculpted fibers, sticks, or other elements of interest. When you’re taking time to consider new bedroom furniture, think thoroughly about how you’re really going to use it. Some people just fall into bed when the lights are out, so anything can work. Others need to wind down from the day by sitting up for a while in bed with a book or conversation. Be sure the headboard of your bed will accommodate the comforts you need to make your way through a good night’s rest. As an example, you might find a neat-looking antique iron or brass bed, get it home, and realize it’s the worst application for sitting up in bed. An upholstered frame looks enticing, too, but can it handle your recently showered head without hair color staining it? Kirsten and her husband have a sturdy piece of furniture with a low headboard—good for stacking pillows against for their night-time regimen. Under-bed storage is crucial for small spaces; there are some really great designs out there to help this addition be useful. 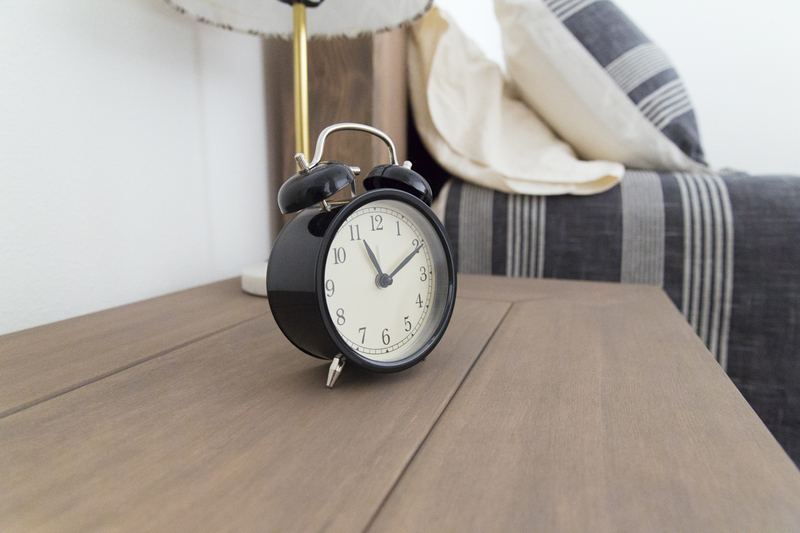 Nightstands should be large enough for bedside lighting and the things you need to help you in and out of bed every day, like phone charging, clocks (if you’re not the phone alarm type), books, digital devices, earbuds, and hand creams. A drawer is always nice to tuck away things you don’t want in view. 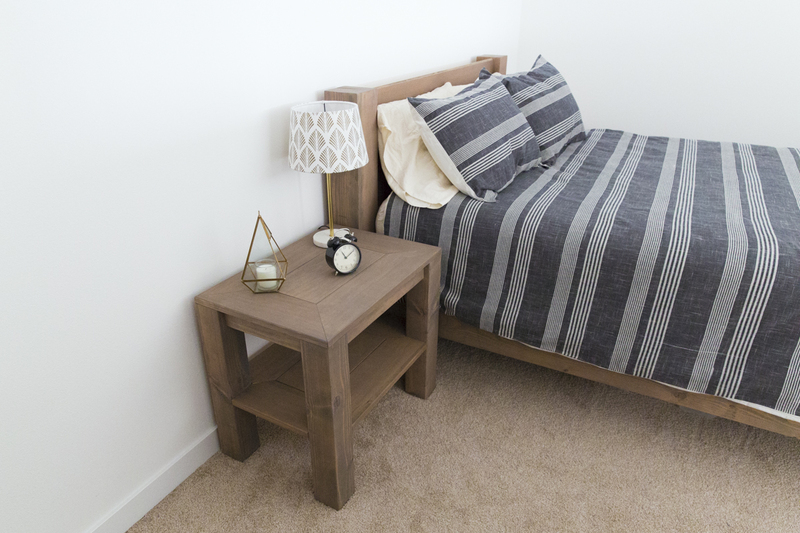 Note from Kirsten: The bed frame and nightstands are beautiful Doug fir pieces that I made, which follow the aesthetic of a design I found online. The original set was selling for several thousand dollars, but I made mine for a fraction of the price. And thanks so much to Keith for his inspiring, space-saving ideas! We hope you find them helpful as you beautify and optimize your living spaces. We're putting a big twist on a classic game by building an oversized outdoor version of chess. I’ve been on the hunt for the perfect laundry basket for the past year. Who knew a laundry basket would be so hard to find? I wanted one that wouldn’t take up too much space and would allow me to separate lights and darks. It also needed to be more appealing than the current pile of laundry sitting at the foot of my bed in a big messy pile!I live in a 1-bedroom apartment in the middle of the city. While browsing around Pinterest I found this gem, and decided to give it a go. Every so often we're fortunate enough to partner with local initiatives. Advent Lutheran Church in Mill Creek grows produce for a local food kitchen. Seeing how we're in the lumber business, we saw it as an opportunity to help build the planter boxes!